A PCB manufacturer. (JLCPCB as an example). 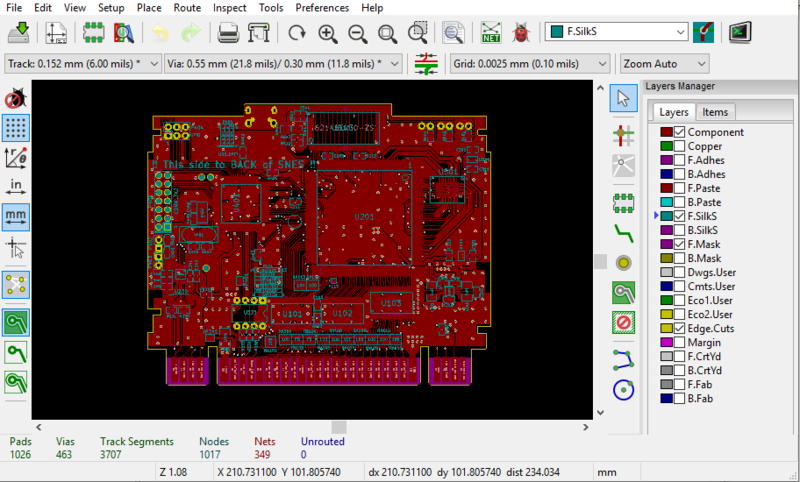 KiCAD Version 5.0 or higher . The git repository from the previous step. Open the PCB layout and make first checks. Plot the PCB layers into Gerber files and create drill files. Zip all of it together for upload. Upload the data to JLCPCB. Do the required JLCPCB configuration. Do final checks on JLCPCB. KiCAD installation on Ubuntu Linux is quite easy. We’ll use a PPA repository available. Detailed instructions can be found here: http://kicad-pcb.org/download/ubuntu/. In short: Add ppa:js-reynaud/kicad-5 , apt update and apt install kicad. That should also take care of all dependencies for you. KiCAD can then be started from the menu or command line with “kicad”. Run KiCAD, then select File -> Open Project (Ctrl-O) and navigate to the folder of the GIT project. Inside that folder, naviage to pcb/kicad, select the Revision you’re interested in (RevK) and then select the sd2snes.pro file. (~/git/retroconsoles/pcb/kicad/RevK if you mirrored the previous step). Component + Copper: Top and bottom layer of the PCB. Contains all the traces for the board. F.SilkS + B.SilkS. Silkscreen layers. These contain the placement details for the PCB. This is extremely important for hand assembly, debugging and repairs. F.Mask + B.Mask. Soldermasks. Critical for assembly. These layers describe where to cover the copper traces and where not. Edge.Cuts. Cutting information. Required by manucfacturer in order to place the outline cuts for your board. F.CrtYd, B.CrtYd, F.Fab, B.Fab. Additional information for design and manufacturing/assembly. Not really critical for production. 3) Plotting the Gerber files, creating drill files. 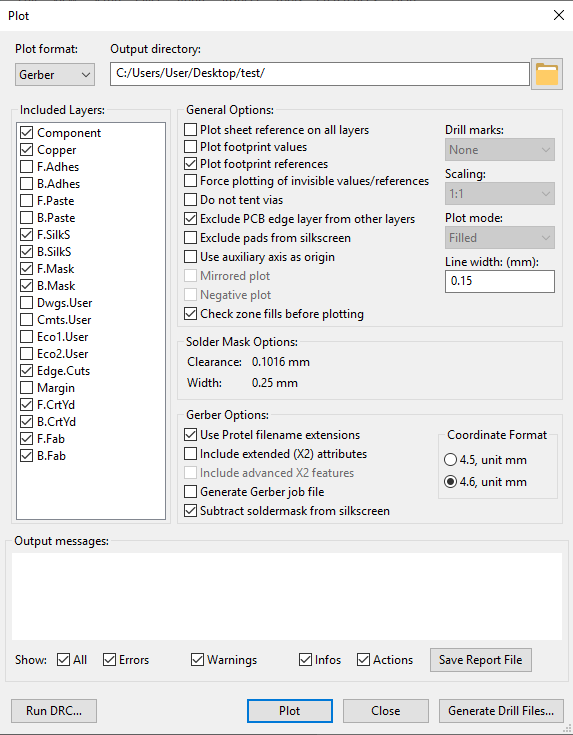 Select File -> Plot… to open the export options for the PCB. It’ll open the following dialog. Make sure you have selected the layers on the left correctly. Also select an output directory that fits your needs. I usually create it in a directory called “production_batch_1” for final exports, and “test” when just trying out stuff. Always keep your production files after you created them, they can come in very handy when debugging the PCB!